If you want to quickly prepare many different foods at once, Waring Professional deep fryer is exactly what you need. This deep fryer makes cooking a pleasure regardless of how much food you’re preparing. Waring Professional deep fryer is a large capacity deep fryer that fries a wide variety of food at once. Waring Professional deep fryer is a three-basket deep fat fryer, perfect for cooking large batches of food. Of course, the idea of frying food at home may sound a little complicated or messy but it certainly isn’t with this deep fryer. Its large capacity, convenience, and features make Waring Professional deep fryer the best deep fryer out there. Of course, this deep fryer fries anything from doughnuts, french fries, chicken, onion rings, etc. It’s made of non-stick, stainless materials, to assure its long life. Obviously, the immersion-style heating element reaches the desired temperature easily. Timer and temperature control help maintain the desired temperature. Also, this deep fryer is safe to use, which is important to mention. Its cool to touch handles will prevent any possible burns. Normally, with a deep fryer such as this you’ll enjoy frying at home, even for the larger groups of friends and family. Waring Professional deep fryer has a long list of pleased customers thanks to its features and performance. Definitely, what makes this deep fryer stand out is the 2.3 pound food capacity. You’ll no longer fear big family gatherings or be dead tired after. Its got 3 baskets, one big and two smaller ones, which means you can fry different foods at once. The oil container, with pouring spot has the capacity of 1 gal. Also, its 1800watt immersion-style heating element reaches the temperature easily and maintains it with no problem. Of course, when you add cold food in hot oil the temperature will slightly drop, but Waring Professional deep fryer quickly recovers. Temperature control and 60-minute digital timer are the key features to help with the temperature. Safety features are definitely worth mentioning as well, and this deep fryer has quite a few. More precisely, the viewing window on the lid prevents from oil spills and splattering while the baskets feature collapsible, cool to touch handles. Of course, there’re number of things to consider when choosing a deep fryer and the dimensions are one of the most important. Normally, you don’t want a deep fryer to take up too much counter space unless you have a big kitchen. If you don’t, it’s no problem, since you can always store the deep fryer away until next use. Waring Professional deep fryer is definitely on the larger side, with the dimensions of 12.8 x 12.8 x 18.5 inches. Of course, the dimensions of this deep fat fryer are directly connected to its capacity. Since it’s a large capacity deep fryer, it’s understandable. Finally, it may take up more space than the most deep fryers, but weighting only 13 pounds, you won’t have any problems moving the deep fryer around whenever you need it. The most important thing about a deep fryer is to fry food evenly. Waring Professional deep fryer takes about 15 minutes to preheat, which is less than the most deep fryers. Keep in mind that we’re talking about a gallon of oil, so the needed time is understandable. Once you put the food in heated oil, all you have to do is wait. Adjust the thermostat by pressing the button and wait until the deep fryer notifies you the oil is hot enough. Of course, whatever you decide to fry, the results will stunt you. 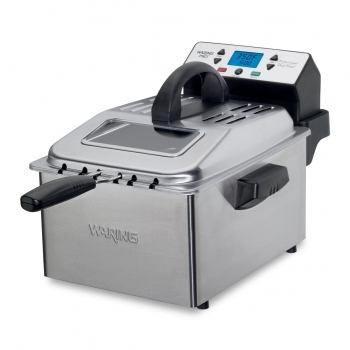 Powered by 1800 watts, Waring Professional deep fryer does the job quickly and efficiently. Understandably, convenience is also an important topic to discuss. Whatever food you’re cooking, and for whatever crowd, you want a deep fryer that’s easy to use. Waring Professional deep fryer is made of brushed stainless steel that’s easy to clean by simply wiping off any stains. Also, it saves you a lot of time on cooking. Imagine having a big family reunion and having to spend the majority of time in the kitchen. This deep fryer helps you avoid that with its large cooking capacity that allows you to prepare lots of food quickly. The oil container is also stainless steel and it’s removable, which allows you to clean it easily. Another convenience worth noting is the lid with viewing window. The window allows you to keep an eye on food in the deep fryer without opening the lid. Of course, working with hot oil is dangerous and you want to be safe at all times. Waring Professional deep fryer includes features to protect you from possibly hurting yourself. More precisely, metal sides of the deep fryer don’t get heated up enough to burn you since there’s enough space between them and the oil container. Also, the handles of all 3 baskets are cool to touch and collapsible. In addition, the lid is vented and it allows steam to escape the deep fryer. This is very important and it prevents burning on hot steam when opening the lid. Finally, the deep fryer is impossible to slide or spill, instead it sits safely on your counter thanks to its skid resistant feet. Normally, you want a good warranty when buying a deep fryer. Note that Waring Professional deep fryer comes with one-year warranty. This isn’t a really long period when compared to other deep fryers on the market. Still, the company offers to repair or replace a defective deep fryer during the period of one year. Customer care team is always available to help with anything regarding your deep fryer. So far, we’re sure you understand why we love this deep fryer so much. Of course, the happy customers have spoken trough reviews and ratings giving this deep fryer 4.3 out of 5 stars. When you buy Waring Professional deep fryer, you get a deep fryer that will change your entire cooking experience. You’ll finally be able to enjoy your favorite fried food without leaving the comfort of your home. Also, this deep fryer will make you love cooking for big gatherings and celebrations. When you look at all the features of Waring Professional deep fryer, it’s easy to see why so many people love it. 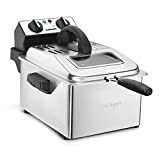 If you are looking for a Deep Fryer with Cool Touch, you can use Hamilton Beach, presto 05442 cooldaddy,T-fal FR8000 Oil Filtration, Presto 05420 FryDaddy or Waring DF55 Professional. Finally, a deep fryer such as this should have its place in your kitchen simply because of its convenient features and the delicious food it provides. Do you own Waring Professional deep fryer? How often do you fry food? Let us know and share your opinions in the comment section.